The scandalous love affair of "The Royal Family of the British Stage" was second in fame and notoriety only to that of the Duke and Duchess of Windsor. Co-authors Roy Moseley (the couple's "honorary" godson and long-standing friend and personal assistant) and Darwin Porter tear away the velvet curtain previously draped over the reputations of this famous team, exposing with searing insights the depths of their sexual excess and interpersonal anguish. Some of the most iconic figures of the 20th century move through chapters that highlight a revelation on every page. Runner-Up in the category of BIOGRAPHY from the 2011 HOLLYWOOD BOOK FESTIVAL. 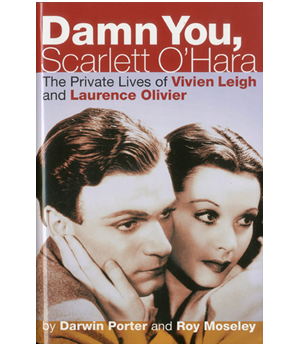 Porter was assisted by Roy Moseley, a long-time collaborator of Laurence Olivier and a devoted firend of Vivien Leigh.